While in rehab in Shepherd Center after my spinal cord injury, a culture of my trach grew out MRSA (methicillin-resistant Staphylococcus aureus), (pronounced mer-sa), the very contagious, hard to kill superbug. My lungs had filled with infected mucus and I wasn’t able cough. The nurses moved me into an isolation room. Every staff member donned yellow paper gowns, blue masks, latex gloves and safety glasses before entering my room. Every assisted cough shot searing pain to both of my shoulders, and it took a month of coughing to clear my lungs. Though still in isolation, but not coughing, my nurses came in without isolation garb. I knew who each one was by her voice. I knew each woman’s story of life. Their loves, their hopes, their dreams and their desires. I knew who they were and that I would remember many. Earl and I returned to Shepherd nine years later. I asked about several but only found two. One woman had cleaned my room five days a week and had achieved her desires. She had married her boyfriend and was working in the finance office at Shepherd. The second woman, a new registered nurse, had a passion for working with persons with spinal cord injuries. She had advanced to the role of clinical coordinator for Shepherd, married and had two sons. I remembered a few names. Jesus never forgets one. Our Shepherd calls us His sheep and we know His voice. He knows our stories from the beginning. Our loves, hopes, dreams and desires. “I am the good shepherd; I know my sheep and my sheep know me” (John 10:14 NIV). “My sheep listen to my voice; I know them, and they follow me” (John 10:27 NIV). 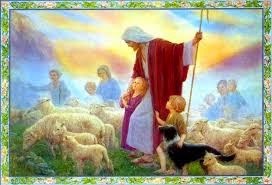 quietspirit, When we listen to the Good Shepherd's voice, we recognize Him and follow Him. Anonymous, My apology for the delayed reply. I've been very sick and continue to be weak. Once again, God has healed me. Praise Him!